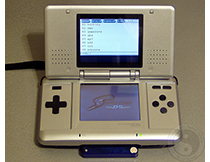 Since the debute of the it's Nintendo DS functionality the SuperCard has come from an inexpensive high-quality solution for the Game Boy Advance (GBA) to a full blown multi-media and development unit. 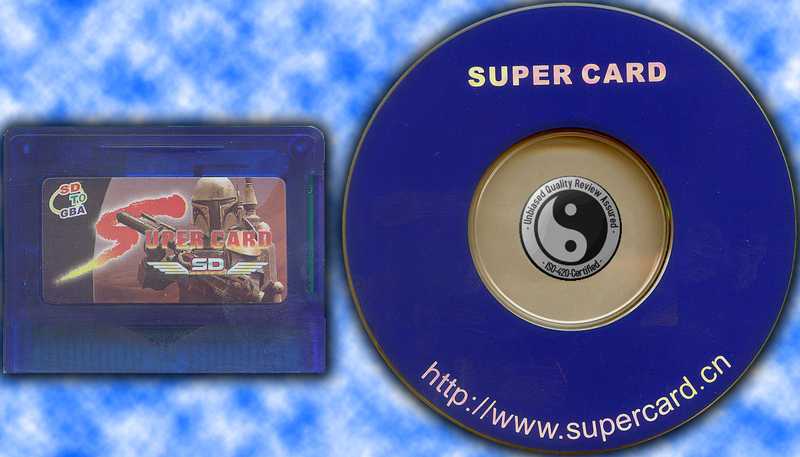 The SuperCard is now ranked is as an invaluable flash cart. Taking a unique approached to its storage medium, the Super Card uses Secure Digital (SD) memory cards instead of expensive proprietary internal memory chips which in turn will save you a large quantity of money and will also give you more storage space. Note that there are two versions of the SuperCard; the SD which I will be reviewing and the Compact Flash (CF). The SuperCard comes in decent mid-grade branded cardboard packaging which inside you will find the flash cart and an 8cm software disc. The flash cart is very sturdy as it's made from high-grade plastic and features a spring release mechanism for inserting and ejecting the SD card. Unlike the SuperCard CF the removable media fits snug into the cart and does not hang out. 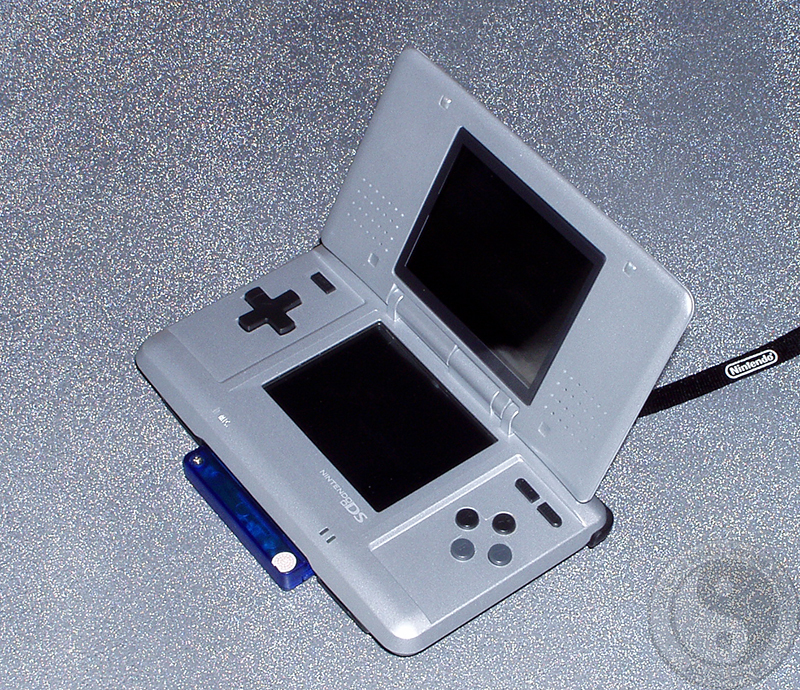 However, removing the card from your Nintendo DS takes a little force as it is a tight fit. Depending on which store you purchased the SuperCard from you may or may not recieve the SuperPass or SuperPass v2. 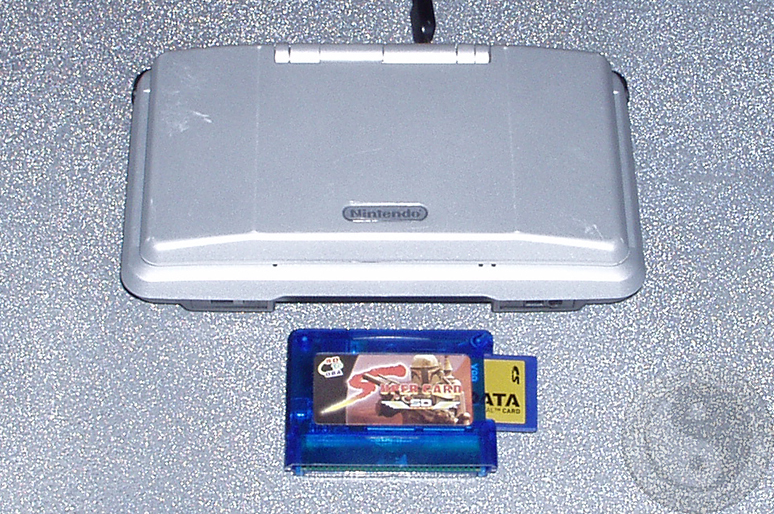 Both units are used for booting Nintendo DS code by redirecting it from the GBA slot. If you currently do not have a PassMe and/or the FlashMe firmware on your Nintendo DS you should get the SuperPass v2 which is compatible with v1-v4 Nintendo DS firmwares. First I looked over the installation disc, read the instructions, visited the SuperCard webpage and searched through the forums. I find doing your homework on a new product before attempting to operate it can save you and others much frustration, time and the occasional migraine headache. If you're starting with a new SD card right out of its packaging you will want to make sure it has been formatted with the FAT16 file system and if it hasn't this is the first thing you should do. Secondly you must prepare certain files so they can be loaded via the SuperCard's operating system, but before I did this I realized the software on the disc was not the most current so I downloaded the newest Game Manger (v2.51) and BIOS (v1.60) updates from SuperCard's homepage. The Game Manager software is an easy to use program with a straight forward design. All you do is select which images you would like to convert, the options for those images and then point it to a location to write them to. Once you select which image(s) you wish to write you can right click on each one and go into it's properties. In there you can choose where to save the SRAM (on the DS card or on the SD card), where to load the ROM from (directly or indirectly from the SD card) and then can pick a few more options. I left the Saver Patch and Rom Positition Patch at their default SD options. Enable Restart will let you do an In Game Reset via pressing while in the game. Doing this will bring you back to the main menu. Enable Trim ROM will cut off any filler data at the end of the ROM that you do not need which can save you some space on your SD card. Faster GamePlay enables 4x DMA which basically loads the game faster. Finally, iQue Game will patch the ROM to work on the iQue Nintendo DS which was released in Japan only. If you're converting GBA images you can pick options then can toggle between the GBA rom patching options and also pick the target directory to write the images to. Saver Patch will enable the Real Time SRAM saving and loading. Enable Restart will enable the In Game Reset, Enable Add Cheats will let you use cheat codes, Enable Compress will compress the images saving you space and Real Time Save will let you save/load your current gamestate at your leasure. Note that each one of these options takes up extra CPU cycles meaning that the more you pick the slower your GBA game will play. Lastly, I rounded up some images for the various built in emulators, which did not need to be converted, uncompressed them and copied them over to the SD card. Unfortunately you cannot directly link your GBA, GBA SP and/or NDS to the computer so you must rely on using an external SD card reader/writer which luckily my printer had one built in. The first thing to do was to test this device in GBA mode so for now I left my PassMe solution out of the equation and booted the NDS. I was greeted with a menu which let me select which file I would like to boot. Everything was working smoothly so far as it read the directory and let me browse through the various files. Sadly due to unknown issues you can only store 64 images per directory. If you are using the SuperPass and would like to boot into GBA mode you can simply press 'select' from the main menu. I explored the GUI a bit, going through its various menu options, which were pretty basic and then decided to boot the BIOS upgrade file. Once I did the SuperCard verified the file was legit and then displayed a menu with the current and the version you're trying to upgrade to and asked you if you want to proceed. I picked yes and after a short period of time the BIOS was upgraded. After this, loaded one of the Game Boy advance games and there was a brief loading time which as I count is around 1 1/2 seconds per megabyte. Once it was loaded it booted just fine and I went exploring around the game and started to test the various functions the SuperCard offers. The first option I tried was the Real Time Save (RTS) feature which worked great. It is a very handy feature to have for portable gaming as sometimes you'll find yourself in a situation where you have to either turn the system off or sit it down and hope the battery does not run out. To say the least it saved and loaded the game perfectly. Next after making my way to the first save point and saving I dumped the SRAM (Saved Game Data) to the cart. To save the life of the SD card you must manually backup the SRAM once you have saved in your game so do not forget to do this if you do not plan on using the RTS feature. When you turn off your SuperCard and then reload the game it will automatically read the SRAM from the SD card so you do not have to load it manually. After this came the cheat system and it was straight forward. Just select the cheats you wish to use and return to the game and now you're a lamer who can blast his or her way through the game without having to actually think. Sadly when playing GBA games I ran into massive amounts of slowdown. Due to the fact each option such as RTS, SRAM and cheating take up memory most games slowed down during gameplay. To remidy this I had to make sure not to combine more then one option per game, but even so there was minor slowdown still present. Slowdown if you didn't know is when the game and music starts to play really slow. With only one option (such as RTS or Cheats) turned on the games featured minor slowdown comparible with old NES games. Now it came time to test the SuperCard SD in Nintendo DS mode. So I inserted the hardware PassMe I purchased from dsPassMe along with the Metroid Prime Hunters Demo Cart then turned on the system. I was greeted by a SuperCard logo on the bottom screen and then the normal interface from the GBA on the top screen. The SuperCard automatically detects if there is a PassKey or equivilant and will boot right into Nintendo DS mode. Using the onscreen menu you can pick which game to boot and then it will instantly load and let you play. Unlike when playing GBA games when it comes time to save your game the SRAM is automatically written to the SD card. There is no slowdown present in Nintendo DS mode and everything worked out and played great. 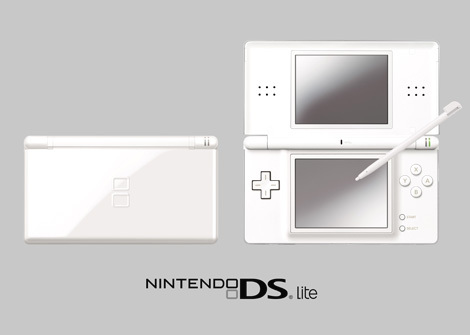 The only problem I ran into were some Nintendo DS images did not like the In Game Reset option selected, so you will have to mess with the options until you find a working combination. Now I moved on to its other features first of which was the built in emulators. Currently the SuperCard BIOS houses built in versions of Goomba (GameBoy Mono/GameBoy Color), PocketNES (NES), PCEAdvance (PC-Engine/Turbo Graphix 16) and DrSMS (Sega Master System/Game Gear). It's too bad you cannot update the emulators yourself as this would be a great feature to have so you can always have the latest builds installed. The first emulator I tried was Goomba (v2.0) and it worked great, featured excellent compatibility, sound, control. Sadly it lacked full screen support and was missing complete GBC support (color palette). Due to the GBC restrictions games that have been coded to only work on the GBC itself will not run. Goomba itself has been updated to support GameBoy color images so if you wish you can use the external emulator for better speed and compatibility which I link to below. The version of PocketNES it uses (v9.97) was never a final version so it did contain some sound bugs, but ran mostly anything I tried loading without issues. If you're going to use your SuperCard to play NES games I would suggest you use your own rom compilation you can make with the latest version of PocketNES and it's image creating utility. Next I tried Dr. SMS (v6.0) and the sound was tolerable, but it did not sale the screen and ran a bit slow. After pressing select I found its menu screen and was able to adjust the screen size and change its speed which fixed both of those issues. You can also save and load your game using this menu, but of course make sure like with the GBA games once you save it in the game to save the SRAM onto the SD card itself. Lastly I tried the PC Engine emulator (PCE Advance v7.3) and it worked out great. With the exception of a few larger images everything booted and played fine. As with this emulator all of the others have thier own menu system (hold the L+R triggers) where you can adjust their settings and manage save games. I would suggest using the emulators built in menus to save with. Next it was time to test the media playback functions. Due to the fact that the media player that comes with the SuperCard is an outdated version of the GB Move Player software that has been used without permission from it's author and has not been optimized to work with the SuperCard's hardware I will not be covering it in this review. I however will focus on the freely available MoonShell media player that can be used on both the Compact Flash and Secure Digital SuperCard's. 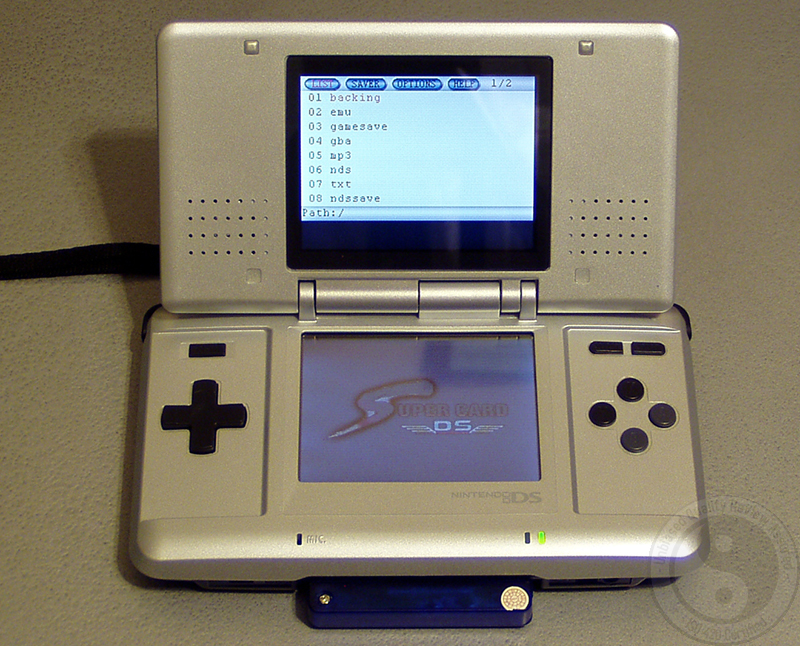 To boot MoonShell you simply copy over the NDS binary onto your SD card. Next, run it in Nintendo DS mode and it will give you a list of directories which you can browse and then load your media files. Moonshell supports playing/viewing NSF, MP3, SPC, GSM, MOD, S3M, IT, XM, MTM, OGG, DPG, Jpeg, BMP, PNG, GIF and Text filetypes. It works pretty well and has crystal clear sound and picture quality. Due to the fact that the SuperCard was never intended for use on the Nintendo DS and that the creators of the device added support for free shows how much the company stands behind their products. Unlike their competitors who just relabel and sell their old units with a price increase the SuperCard team prides itself in producing new and innovative features for their current line of products without leaving the old ones in the dust. When it comes to booting homebrew/backups the SuperCard does what it is supposed to do and does it well. Sadly, the media player software they use isn't liscensed and doesn't work well and without the freely aviable MoonShell the device would be lacking proper media playback support. When all is said and done based on the units functionaility and compatibility I would rate this unit in the middle compared to the rest of the fish in the sea.